Rosina Wachtmeister is an Austrian artist who has lived in Capena for many years and has worked hard, with her family, to make it a better and more interesting place. Rosina – as she is affectionately known to everyone in Capena – is famous for her brightly coloured paintings and sculptures, which have included scenes in the village’s old quarter. Her crescent-headed Cats of Capena have featured on every conceivable item from cards, posters, jigsaws and calendars to ceramics, umbrellas, bags – and even a range of Rosina’s Finest organic cat food. Rosina’s daughter Gabila is a skilled artist in her own right and her son Battista studied ceramics in Germany. 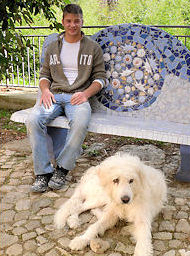 Together with his friend Nina, Battista is responsible for many of the striking Gaudiesque ceramic and mosaic creations you can see in Capena. Rosina is a great animal lover and – apart from owning her own mini-​​menagerie of cats, peacocks and a pelican – has also estab­lished a rescue centre for stray dogs. Capena has recently undergone a major overhaul, with the addition of a new car park that has enabled the Piazza del Popolo to be pedes­tri­anised. Now that the building work is over and things are back to normal, Rosina has generously donated a set of wonderful mosaic benches and sculptures to help the villagers to enjoy their traffic-​​free surroundings. These were created over several months by a team of helpers, led by Battista and Nina. The main work is a covered seating area on Via Silla overlooking the car park. This features intricate mosaic seats with animal forms including a huge snake, crocodile and tortoises. Until you see it, you couldn’t have imagined that a seating area above a car park could be so lovely. It’s popular with locals of all ages as a place to rest and chat. The other benches are located around and within piazza and the Rocca.